Just arrived into Preston store we have the all new Innuos ZEN mini MK3. With all the all the CD ripping convenience of the MK2 but with added upgrades to make it even more appealing to home digital music streaming enthusiasts. As before the ZEN mini is available with 1/2/4/8 Tb internal storage, we opted for the 1TB at £899. Innuos have made connectivity upgrades by adding a custom motherboard to include two Ethernet ports for network pass through to other network devices that are close by, this helps with audio playback performance. The ZEN Mini MK3 now incorporates analogue/coaxial and optical outputs, we have used these in store and partnered it up with the Cyrus One HD and used the Neat Iota Alpha speakers and we were blown away with how it performed, whilst being so neat and compact. As for controlling the ZEN simply type my.innuos.com into your browser and up it pops! Taking around 5-10 minutes to copy an album (depending on which ripping mode is selected), all you need to do is pick the file format you require supporting DSD, FLAC and WAV, we tend to stick with FLAC as it takes up less space. All the album artwork is found making for easy navigation of your collection. If you want to control the ZEN from a tablet we have found a great free app for Android called Squeezer, if your using an Apple IOS product iPeng can be purchased for £8.99. Also available is the new dual-linear power supply if want to get even more performance from the product at £499 or £449 if purchased together with the ZEN at the same time. My skepticism of high end ripping units has always been true but the Innuos Zen Mini Mk3 has swayed me to say the least. The simplicity of feeding it a CD and seeing magically appearing on your streaming platform can’t be underestimated. Capable of storing up to a thousand CDs on even it’s smallest 1TB hard drive the Innuos Zen Mini Mk3 gives you ample room to grow your music collection. This is not to say that it doesn’t have the nerd out stats and control that many of us (including myself) desire. Simply type my.innuos.com into your browser and there it is, supporting DSD, FLAC and WAV at CD native bit rates. The Innuos Zen Mini Mk3 isn’t simply a music server, it competently takes on the role of streaming as well. Having both digital and analogue output makes the price tag very appealing and working with Squeezebox gives you access to Tidal, Spotify and Qobuz at hi-res with no limitations. It also has a Roon core built in as standard. The Zen Mini is built with fantastic precision having hardware that quite literally outperforms the very computer I’m writing this blog on! An Intel Quad Core with 4GB Ram is more than you could ever need. The slot loading TEAC disc drive rips through a CD in about 5 minutes, getting you through your collection quickly. The auto metadata collection is accurate and foolproof. Any unrecognised albums are conveniently put under ‘quarantine’ for later review and manual tagging. Considering it costs less than many streamers that exist today it’s a hard product to dismiss, killing two birds with one stone. I simply can’t find anything to improve being one of the easiest Hi-Fi products I’ve ever used and with excellent sound quality to boot! if you’re in the market to digitise your music collection and de-clutter without compromising on sound quality, then we would certainly recommend giving the Innuos Zen Mini serious consideration. As always, we’re happy to give you a demonstration. We will be joined by representatives from Naim Audio, who will not only demonstrate the products but answer any questions you may have about them. From there you are able to add your network player of choice, starting with the Uniti Atom. If you have a larger room or even a larger room and bigger speakers it could be the Uniti Nova that would suit you best. If you are one of those people who like to still play CDs and also have the ability to rip them to some local storage such as an SD card or USB drive then the Uniti Star would be just the job for you. We will be demonstrating these through a pair of ProAc Response D20R loudspeakers and the ProAc representative will also be there if you have any questions regarding their speakers. So please don't be shy, come along and experience an evening of great products and great tunes, tickets can be booked here, if that isn't enough all attendees can enter our FREE prize draw* to win one of 3 Mu-So QB's worth £649 each. *T&Cs apply. Mu-So Qb prizes are for the entire roadshow not per event. One entry per person. Prize draw will take place after the final roadshow event on the 9th November and the lucky winners notified by phone or email and published in the Audio T eClub newsletter. Julian, Paul & John look forward to seeing you on the night. 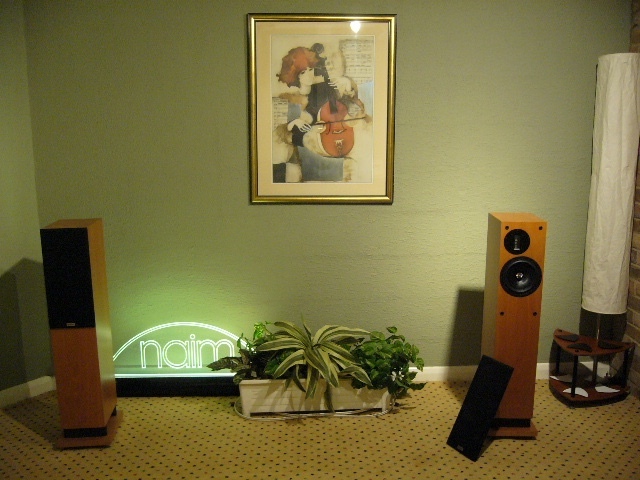 Naim Uniti products are stocked at all branches of Audio T.
ProAc loudspeakers are stocked in Brighton and Preston. When you open the box for the Encore you are presented with an 18.3 Kg beast of a unit! This 225 watt box of musical delights is really solidly built and as such fills you with confidence even before you plug it in. The Musical Fidelity Encore 225's purpose is to provide a one box solution designed to take away the fuss that usually entails when you take your first steps into streaming. There is no need to have a separate storage unit such as a network attached storage (NAS) drive as the Encore has its own 1TB (upgradeable) hard drive built in. You can connect the Encore to your network and you can drag and drop music onto it. Not only that, but it comes equipped with a CD drive which can work as a CD player but is also a ripper. Copying your CD collection could not be simpler, just put it in the drive and the Encore takes care of the rest. Using the Apple or Android App you then simply find your music and press play. The large high resolution display on the front panel will then show the artwork and track you are currently playing. It's not limited to playing music from the hard drive or CD though, as the Encore integrates the music subscription service Tidal through its App allowing CD quality playback from their large jukebox in the cloud. Also around the back of the unit you will find 3 pairs of RCA inputs, 4 digital inputs and a couple of USB inputs for expanding the units storage. Also on the front panel it has a high quality headphone output. As previously mentioned the Encore has 225 watts per channel plenty enough for the vast majority of speakers out there and enough to always keep things under control. We have tried it on a number of different speaker makes and models including Dynaudio, Neat, Bowers and Wilkins, PMC and it worked well with all of them so it's certainly not a fussy amplifier. We also tried a variety of music genres. Playing Antonin Dvorak Op. 77 Scherzo performed by the Berlin Philharmonic String Quartet showed just how much grip on the speakers the amplifier has as the dynamics of the performance shone from the first bar onwards. Tippers Gulch from his Backwards Forwards album memorised with the scale of the sound stage and again this showed the amplifiers control as the speakers didn't trip up once as the sounds in the track twisted and turned. It not all about power though, as the Encore is really good at resolving the detail. On Agnes Obel's Aventine you could hear every last nuance in her voice and the strings giving the impression the artists were in the room with you. All in all we think the Encore is a great sounding product and perfect for the modern ways of music consumption. The Encore 225 offers a lot of product for the money. Of course you can come and hear it for yourself, Just give us a call for a demonstration on 0117 926 4975. This beautifully built machine is a complete system in one box. The Encore 225 comprises an amplifier with the same power amplifiers as the Musical Fidelity M6si integrated, and CD drive which can rip your discs to internal storage (1TB and 2TB versions are available). It can also play CDs, has a host of inputs for external devices, can access Internet radio and Tidal and can even be seen as a network storage device by other products such as Sonos! The build quality is exceptional with very solid casework edged with heatsinks which are necessary as this baby runs weighted very much into class A. The Encore 225 has a beautiful high resolution display which will show your album artwork as it plays. In its simplest form just pop in a CD which it will rip automatically to internal storage in a high quality file, go to "my music" and playback from the usual sorted list, but it can do so much more, acting as a digital and analogue hub with enough inputs to satisfy most people. So what does the Encore 225 sound like? Put simply it is just superb! Seen here with the Dali Opticon 5 floorstanders it is currently filling our dem room with a big, warm, detailed and expansive sound, full of rhythm and music whether you're listening to the Bruckner Motets or the latest album from Deadmau5. We've been loading ours up with music and playing with the control features, both from the front buttons and the dedicated app and it has been a delight to use. This one definitely has the Boswell seal of approval! So in conclusion the Musical Fidelity Encore 225 is a gem of a system, all in one box and a breeze to use! At the moment Musical Fidelity are offering a trade in for a limited time, where you will get the cost of your old Musical Fidelity amplifier (up to £1550) off the Encore 225 which is a great deal! Come and have a listen! We have two Hi-Fi brands which are new to the shop this month Musical Fidelity electronics and Dali loudspeakers. As we have found, they are capable of making beautiful music together. An array of Dali speakers and Musical Fidelity electronics. Musical Fidelity is a well established British Hi-Fi company who have been exciting and innovating for many years. 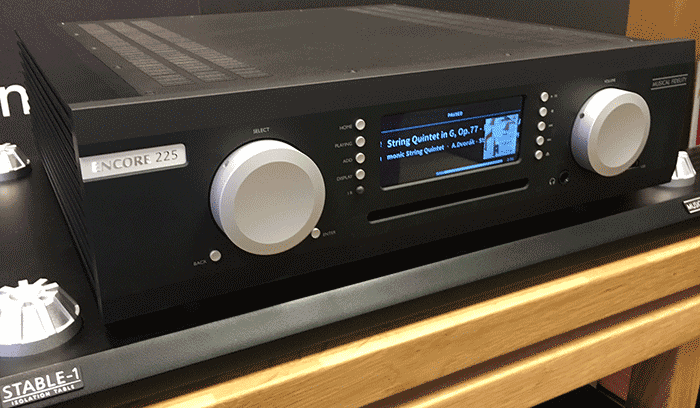 Shown here are the M3si integrated amp, the M3s CD player and the M6si integrated. The M6s CD player will follow soon. All of these components follow the Musical Fidelity ethos of making accurate, but exciting music. This amazing one box system is a music store, CD player, streamer, and amplifier all in one incredibly intuitive and easy to use package. It sounds wonderful too! Dali are a Danish loudspeaker manufacturer who have been going for over 30 years producing everything from budget to high end speakers. We're still discovering what these can do but we have representatives from the Spektor, Zensor and Opticon ranges plus the beautiful little Menuets and the rather stylish Katch portable bluetooth speaker. Both brands seem to major on creating large believable soundstages; a recording of the Tallis Scholars singing Tallis anthems filled the room with the sense of a cathedral, while the perennial "Wish You Were Here" by Pink Floyd was huge! We'll report more as we get to know these components, but suffice to say we're excited and looking forward to the discovery. Why not come and have a listen yourself? And finally all components in this blog have the Boswell seal of approval! We auditioned the Plato Class B about a year ago and thought that it was a fantastic product well thought out and well engineered but we had some misgivings about the sound quality. Not that it sounded bad but it didn't quite hit the mark when factoring in what our customers expect us to be selling. At Sound & Vision - The Bristol Show Convert launched the Plato Class A all In One Hi-Fi system which we are taking a closer look at here. 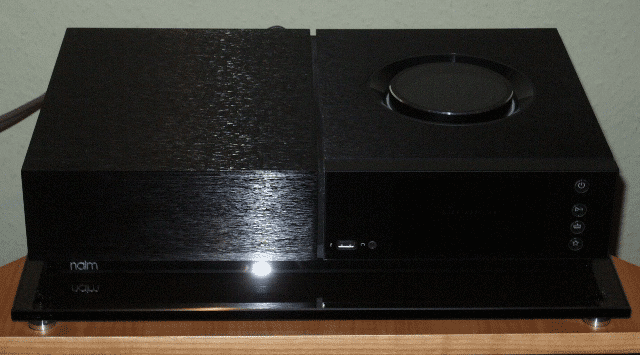 Essentially it's the same product as the earlier model but with a better Class A amplifier. Normally a class A design would generate a lot of heat and as such you will find that they are usually large with an array of heat sinks to dissipate the heat. Convert have used some clever technology to avoid this and as result you get class A performance without the bulky box. In fact we think that it looks very modern, uncomplicated with clean lines and just the right amount of curve. It would even look good on a sideboard we think. So, what else does the Plato do? It would probably be easier to describe what it can't do. The initial idea Convert had was to create a device that will record Vinyl in a sophisticated no nonsense way. Plenty of ins and outs on the rear. That initial idea is delivered in spades as there is not a better vinyl ripper on the market. It will handle both MC and MM cartridges and records up-to 24bit 192khz. When you drop the needle on the record it will intelligently look up the recording online and deliver the album art and track names as well as split the recording into tracks. This is very clever and couldn't be simpler. As well as recording Vinyl you can also record your cassettes or any other analogue format just plug in and away you go. The Plato is also a streamer and a ripper. The observant amongst you will have noticed from the picture that it doesn't have a CD draw. They get round this by supplying a USB drive along with an android tablet which gives complete control over the unit. The 2TB of internal storage you get should be enough for most but as it is a streamer as well it would be easy to expand on that if needed. We listened to the unit using a variety of music including ripped vinyl (which sounds really good) recordings from the hard drive and recordings off our network. The class A 'sound' smothered us not in a soft gooey way but in way that is very pleasing to the ear. Nothing we played tripped the unit up. So the Pixies Doolittle album didn't sound harsh at all as it often can. Massive Attack's Mezzanine sounded great with a very pleasing bass that was not necessarily as tight as some A/B amps can muster but with texture that those amps only hint at. The all important mid range is handled excellently, with Teardrop off Mezzanine touching the back of the spine if you know what I mean. All in all we think the audio performance is excellent and that coupled with it's massive feature list the Convert Plato deserves a place in the shop. You may not need all the features it offers but even if you just need storage and streaming in an attractive package it is well worth a listen. As always don't take our word for it, come and have a listen. Convert Technologies Plato Class A is available for demonstration at Audio T Bristol. We are delighted to announce the inclusion of a number of new products, two of which are wholly new suppliers to the Reading store. 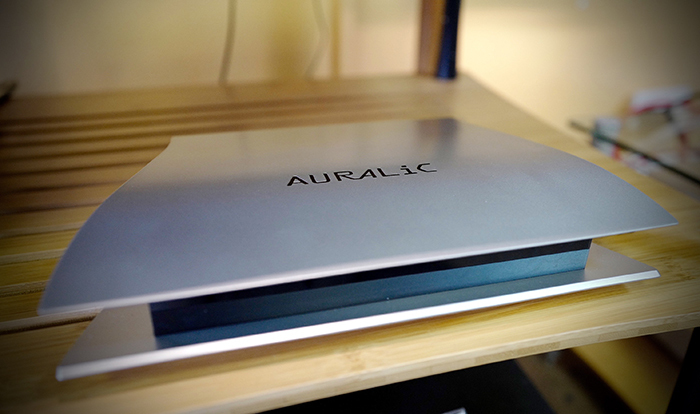 For us the timing could not be better than now to introduce Auralic to our range. In an age of ever decreasing CD player sales, we have been looking, as have many of our customers, for a streaming solution that is universal, i.e. matches any existing brand and at the same time is affordable. Auralic are just such a brand. Indeed maybe the only one at present? From as little as just £449, the Aries Mini is a serious quality, tiny (about the size of an Apple TV) full HD streamer (up to DSD even over WiFi) and client in one. With analogue outputs included and the ability to fit an SSD drive internally, it can be a complete solution and simultaneously serve other rooms. For the audiophile the Auralic Aries (£1495) is their high-end solution for streaming, just add your own DAC to the required level. For those looking for an entire digital streaming compact separates system we have the Altair streamer/pre-amp and Merak 200w Monoblock amps. Just add speakers. £5747. Key to the Auralic experience is their fantastic IOS app, Lightning DS. By far the most powerful and intuitive music app we've used to date. Giving you full access to your local music library as well as direct to your Tidal or Qobuz accounts. To complement the Auralic and any other streamers we have chosen Innuos. 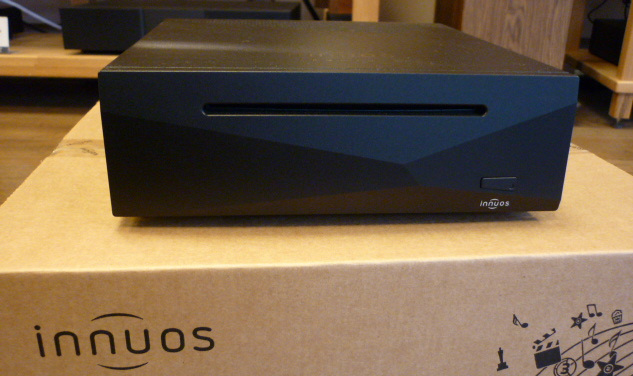 Innuos make a range of Server/CD rippers starting from as little as £699. Simply slide in a CD and the unit rips, downloads metadata and artwork and builds your library. Full editing access is by an excellent cross-platform browser support page. In a crowded market place full of great speakers (well here anyway) there seems little room for more. That would be true if they didn't offer something new and fresh, a different perspective perhaps or a different set of priorities. In Russell K's designs we have just that; a fresh outlook. Russell's top priority was to convey the artist's message more than anything else but not at the expense of tonal colourations and other distortions; a tall order. His solution was not to follow, but to lead by thinking afresh the design parameters. His designs have to internal wadding whatsoever, thin cabinets walls and a thick baffle. The result; speakers that cut straight to the performance with no perceivable time smearing and are capable of serious musical engagement. They have an incredible bass response belying their size and can be driven by affordable amplifiers. We rather like them! Three models are available; The original RK Red 100 and the smaller Red 50, both standmounts and available in gloss black (premium) or a variety of wood veneers. The Red 150 floorstanders, small but full range. After what must be over 25 years, Cyrus again have a model One. Naturally, apart from its dimensions and overall design it's all new and technologically up-to-date. A little powerhouse of an amp capable of driving any speaker likely to be used at the price point, it's immediate and fun with a great sense of drive, a truly worthy successor. As everyone knows the way we listen to music has been revolutionised over the last decade. A whole new generation of streamers, digital to analogue converters and music servers means that we can now listen to our digital music from CD rips, music streaming services, or Hi-Res downloads in very high quality. One such device that has become very popular recently is the CD ripper and music server; a way of both storing, archiving and playing your music collection wirelessly or hardwired in your home. Amongst the very best of these devices are the Innuos Zen series. Innuos have three models in the series, the Zen Mini Mk2, Zen Mk2 and Zenith Mk2, it’s the Zen Mini we are looking at today although all three have the same functions just with increases in sound quality as you go up the range. The Zen Mini’s functionality is incredibly vast but we’ll keep things simple to start off with. Inserting a CD into this slick looking black box will result in it being automatically ripped to the internal hard drive (available in 1 or 2TB) in FLAC or WAV format. Track information and album work will be found by the system and then the CD will be ejected once the rip is complete and hey presto! You have the start of digital music collection. If your music that is already stored digitally, on a computer for example, it can also be transferred on to the hard drive via your network (more on that later). You have plenty of options on how to play your music from there; the Zen Mini is compatible with a huge range of wireless, multi-room systems, Sonos being the prime example. It is a UPnP server so any streamers attached to your network will also be able to pick up your music either wirelessly or via Ethernet. Playback is also supported via the USB port which can be connected to a DAC (Digital to Analogue Converter). Finally for those streaming fans the Zen Mini includes, Qobuz (We're offering a FREE 1 Month Trial and a FREE Hi-Res download until the end of November 2016), Tidal, Spotify, Iplayer and internet radio. 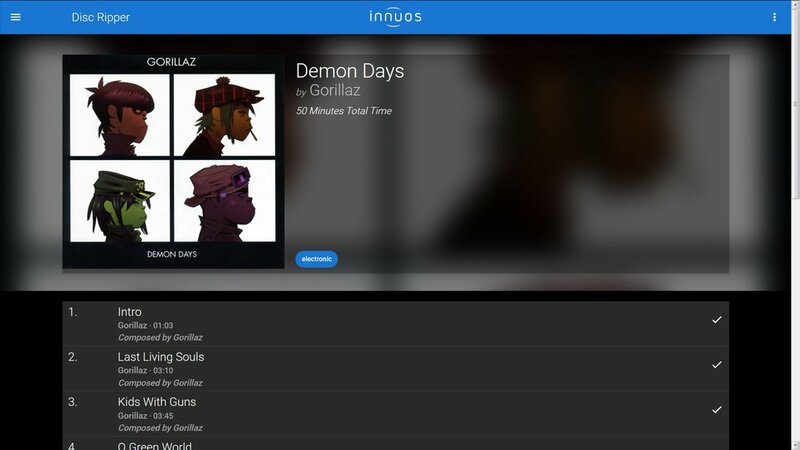 By visiting the Innuos page from your web browser (www.my.innuos.com) you can access the Zen Mini’s library and there you have a huge array of options like editing the track names, order, art work etc. It's here that you can also manage your collection by moving music from other places on your network, such as your computer onto the Zen Mini. There is also a large array of apps available for both Apple and Android that are capable of controlling the playback from the unit, meaning you don’t need to use a computer at all. The Zen Mini has no fans at all so when we tested it in our demo room it made no noticeable noise at all. We tested it with multiple systems both through the network and through the USB into a DAC and we were very impressed with the reproduction of the digital files, it simply sounds fantastic. With its huge range of functionality, high build quality, ease of use and fantastic sound quality the Innuos Zen series may just well be the future of music storage and playback. For further information or if you would like a demonstration please get in touch!